you can buy an existing property with the possibility that it needs only a little (and some a lot) of renovation. you can buy a completely new built house, and basically get the keys and move right in. you can buy a plot of land and build a brand new house on it, completely according to your own wishes. There are quite a number of existing properties on the market of Lesvos and many of those are habitable houses which need little renovation. They are often traditionally built with use of stone and wood. There are also those existing houses which are often much older and deserted and a number of those are located in the more remote areas. These older houses require extensive renovation to make them suitable for today’s living standards and are not immediately habitable. Many people are attracted to the simplicity of traditional stone houses, however it is good to keep in mind that the renovation costs can easily exceed the cost of building a new house of similar size. Finding an out-of-the-box newly built house, villa or apartment can be an easy and quick way of buying a property in Lesvos. The offerings of such properties have increased over the last years and the quality of these properties are often very good. There are many advantages of buying a newly built house. Number one is of course that they do not need any renovations at all which means that there are no extra costs involved. When you have received the keys you can basically move right in. Another advantage is that many of these houses come with extra luxuries, such as larger and fully equipped kitchens and bathrooms which the existing and older houses often lack. The only real disadvantage is that you have less control over your personal design. This last option is what most people dream about when they are exploring the possibilities of buying or investing in Lesvos. Building your own property on a private plot of land is a reasonable option when you have the finances to support this. When you purchase a plot of land and commission an architect you will have a lot more control over the location, views, and the proximity of neighbours. 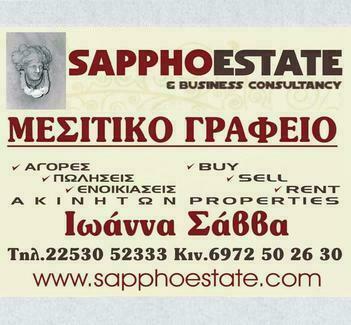 Sappho Estate can assist you with contacting architects and building contrators or if you have your own building plans already, advice how and where to proceed with getting your dream house built for you. If you decide to build a new house, though can't manage the construction activities yourself then you are invited to work with us to get the job done.